It’s kinda nice to own cool and unique USB gadgets. Seeing as we live in a time when almost everything comes with a USB power option, use of USB devices is on the rise and these gadgets seem to be a breath of fresh air. There are some really cool designs out there that will blow your mind right into the stratosphere. From bottles to microscopes and turntables, you can find them all. Below is a small list of some of the most unique designs for USB powered devices. This one is one of the most unique USB gadgets out there. Basically it is a cooler which you can use to keep drinks chilled and ready to drink. This one is especially helpful for gamers as they can keep their favorite drinks chilled and ready while they play for hours on end on their computers. But these are not made only for the gamers. You can use this handy device in office too. Imagine having a cold refreshing drink to keep all the office frustrations at bay. You can chill your drink to about 45 degrees Fahrenheit. This is another device that makes the most unique USB gadgets list. 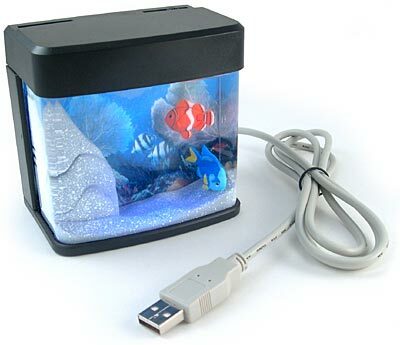 This one is a real mini aquarium with two life-like fishes. Yes you heard it right. The aquarium is real but the fishes are not. They are just for display. This device also has LED lights inside to add some beautiful blue lighting to it. It also has a mini motor that generates current in the water. This tiny current makes the two fishes in the water to move about here and there. Your desk top at the office will never be the same again. While we’re on the topic of unique USB gadgets for the office, the USB Air conditioned shirt definitely deserves a mention. Sometimes you’ll have to work in extremely hot weather and nothing can ruin your mood more than hot weather. You look around and you find out that the air conditioner or the fan in your office isn’t functioning properly. Well, you don’t have to worry anymore because the USB shirt is here. This shirt actually has two small 10 cm fans inside to keep you cool at all times. This shirt is USB powered, so say hello to coolness all year long. This is one of the most unique USB gadgets available today for the biology students everywhere. 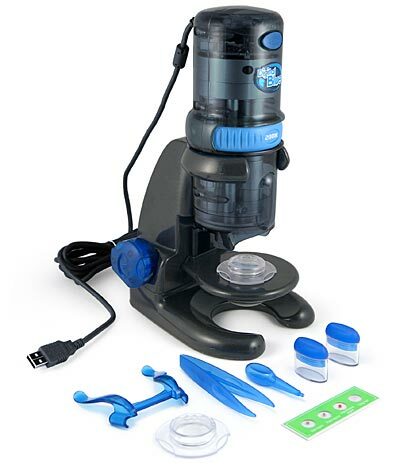 This USB powered microscope has a 200X magnification and can even take snapshots. It also comes with the necessary software. All the biology students in the world can rejoice as they make small glimpses into a whole new world. You can also get a number of useful items along with this device like tweezers, sample slide, eyedropper and specimen jars. 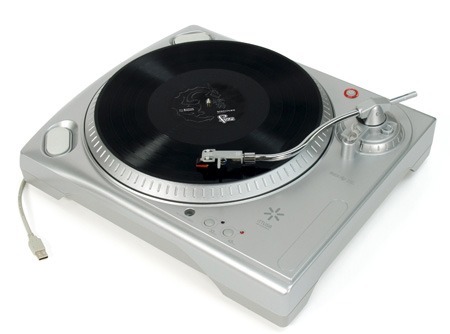 One of the coolest and most unique USB gadgets out there, the USB turntable is the perfect gift for all those who still love the great vinyl records of yesterday. It also comes with the Audacity software; a great software for audio recording. You can connect this to your computer and digitalize your vinyl songs. No longer will you have to worry about all those great songs getting lost with time. You can even improve upon the songs with the audacity software.